I bought this combo before I had a family and it was great! The dryer is just the perfect size for me. I didn’t have many clothes and I liked the space it saved. I lived in a small small condo. Eventually I got married and now have an 8 month old and its capacity is starting to not measure up to my needs. It runs fine though. It dries my clothes relatively quickly and is really easy to clean. I have not had any problems with it mechanically. It is easy to clean because the drum has a porcelain enamel. I once accidently left a pen in my pants and it exploded and when I notices my dryer was inked up, I sprayed a cleaner on it and it required little scrubbing to remove. It generally dries my clothes quickly except my sweatshirts. Those I usually have to dry twice. It’s not the biggest inconvenience in the world but is a little annoying in winter. Now that I have a bigger family we are washing more and more clothes and the capacity is not big enough. I paid a lot of money for this so I am not going to get rid of it just because of this but I wouldn’t recommend to anyone who is starting a family or has a big family already. Over all this is a perfect set if you are living by yourself and only responsible for washing your own clothes. It Dries quickly (other than sweatshirts) and is very good on space. I would rate this dryer a 3.5 out of 5 stars. The biggest reason i like this washer dryer combo is it doesnt take up much space. It operates quietly. A con about this washer dryer combo is it needs to hold more clothes. It also tends take a while to dry clothes! This on the of the best washer/dryer combos i have used in a while. My old washer and dryer broke so i needed a new one. 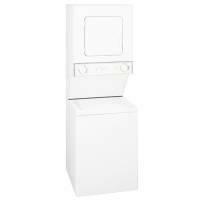 I began looking around and need a washer dryer combo that was compact because i didn't have much room in the house. I enjoy the smooth quiet operation of my GE dryer. The only draw back that i really see is the amount of clothes that i can fit into them. I would just like a little more room to some more clothes. I would also like the dry times to be a little shorter since i am a traveling man and need to do laundry on the fly.